See where the property is located. 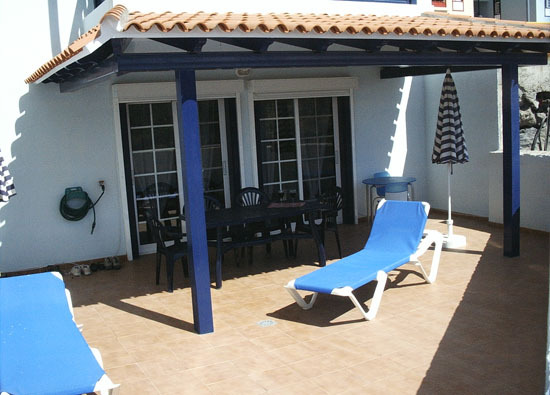 Welcome to our lovely apartment in Callao Salvaje on the south coast of the island Tenerife. If you are looking for a high standard self-catering holiday, you can stop searching! This beautiful property, which can sleep upto 6 people, will provide you a tranquil holiday of sun and relaxation. 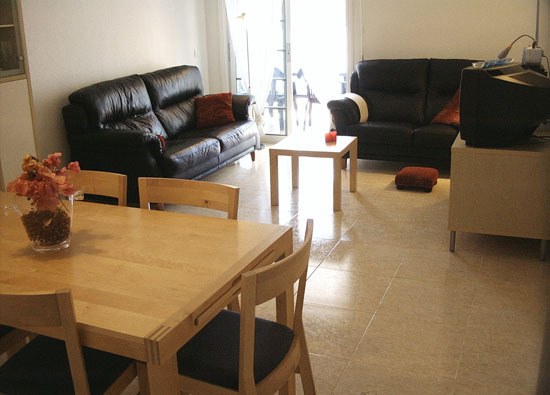 The apartment has a spacious living room and is comfortably furnished. Patio Doors open onto a large private and half-covered terrace with patio furniture for those who wish to eat outside, there is a second terrace at the opposite side also furnished with everything you need. The fully equipped kitchen includes a microwave, kettle, toaster and ample cutlery and crockery, electric bbq, washing machine, an iron with ironing board. The main bedroom has a king size double bed and a suite bathroom. The ‘yellow bedroom’ has a single bed which can be turned into twin beds. The ‘red bedroom’ has a bunk bed. There’s a second bathroom in the hallway. All bedrooms have large fitted wardrobes, bedside cabinets, with lamps. The main bedroom has ceiling fan. The 2 bathrooms are fully tiled and have a bath/shower, WC and wash basin, all with hot water off course. All linen and towels, sheets, etc. are supplied. (Note: please bring your own Beach Towels). For those who simply seek rest and tranquillity, there is ample opportunity for the most commendable pursuit of sitting on the patio, keeping an eye out for charming little lizards seeking the warmth of the rocks and stones or have a swim and enjoy the large pool area with seperate childrens pool. The property also offers a lift bringing you to the right floor where te apartment is situated. Allthough you’ll probably only use it to bring your luggage one floor down. Satellite TV is installed with Dutch, German, Spanish and English Speaking Channels (under normal circumstances).